Mechelen, a city of 85 600 inhabitants in the Flanders region of Belgium, has launched an intelligent street lighting pilot project specially developed for sidewalks and bicycle paths. The pilot, implemented by the city council of Mechelen and its lighting service provider Fluvius (formerly known as Eandis), consists of six LED lamps combined with sensors on Schoutetstraat street that illuminate the street based on the movements of pedestrians and cyclists. The lighting level is set at 20 % when the street is empty, and as soon as a pedestrian or a cyclist approaches, the sensors installed trigger a gradual increase in the lighting level. “I am glad Fluvius has started this pilot project and I am curious about the results and the response of the public. I am also looking forward to installing similar intelligent street lighting for many other places, not only in the city, but also on more rural cycle paths. We do not compromise on safety, and we become more economical, efficient and environment-friendly. This is a social win-win situation,” says Bart De Nijn, Responsible for Public Works at the Mechelen Town Council. 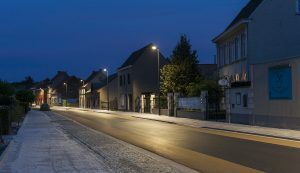 Mechelen has already started to replace its public lighting with LEDs, with an additional option of dimming. It aims to systematically convert all public lighting – streets, local squares and a few monuments – to energy efficient lighting. An edited version of this article originally appeared in (Issue #8, March 2019).